LibriVox Audio Books provides free access to over 24,000 audio books in more than 30 languages. Each audiobook can be streamed over the internet or downloaded for later use. All LibriVox audio books can be freely listened to and shared. "My kids travel with me frequently. They like books but I cannot take them all with us on long flights. I downloaded LibriVox Audio Books. It is easy to use and download books my kids want to listen too. I find it makes life easier when they are occupied. Iike sharing the good books with my other parent friends." "LibriVox is awesome because it provides a service that is free and sought after. A lot of other providers charge up to 14 dollars per book and LibriVox is the opposite of that! " "LibriVox Audio Books really hits the nail on the head if you want to listen to audio books on your smart phone. It's a wonderful program. However, though they boast about their number of books, most of them are older so it can be hard to find newer releases." "LibriVox makes Audio Book download and streaming easy. Anybody that likes to pass the time listening to their books instead of reading them really should check this out. There's a huge amount of available books out there too!" "Guys, this is also availabe in ios so it's a plus for me! It is not some sort of a torrent site so if you are expecting torrents, this is not for you. Their catalogues can be browsed according to genre/ language/ author and it gives you two options when you go to their page, either listen or read :D Great site!" "This is an app that audio book lovers will enjoy. The wide variety of books on offer, and the ability to stream books at anytime, is a great asset." "LibriVox has always been reliable when it comes to audiobooks and I really liked that most of the books I wanted to read are here on the site! It's a plus that some are in high quality. Some arent though." "Overall this is a decent audiobook app but it has its flaws. The romance section is rather lacking here. The interface is clunky at times and it makes you wish it were more sleek and responsive like other apps. " 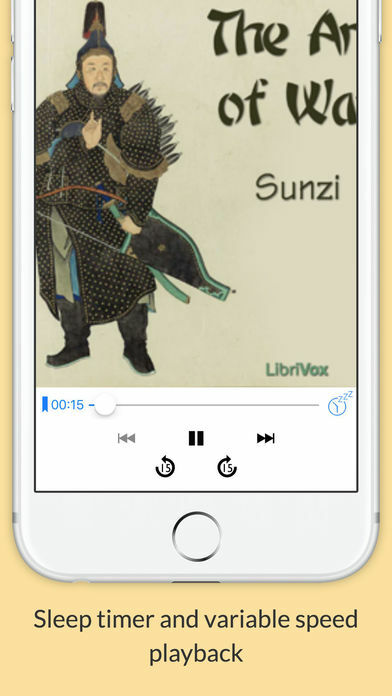 "LibriVox Audio Books is the perfect audiobook app for me. There are so many free audiobooks for me to listen to while I workout or on long drives or when I'm waiting for... well, all the things you have to wait for (appointments, trains, washers and dryers, etc.). I especially like that so many genres are available for listening because sometimes I feel like a short story and sometimes a biography." "I like the interface of LibriVox, and really like the huge selection. However, the DRM included really grates me. When you purchase the books, you don't 'own' them. You have to keep paying I subscription; I was very disappointed." 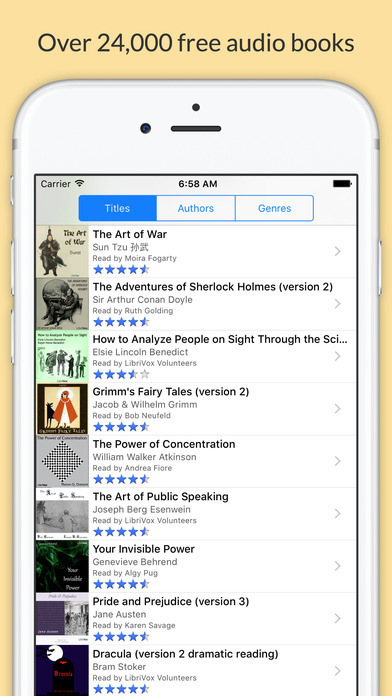 "I really enjoy using LibriVox when looking for audiobooks on my iPhone. There are thousands of audiobooks that don't require any extra money! " 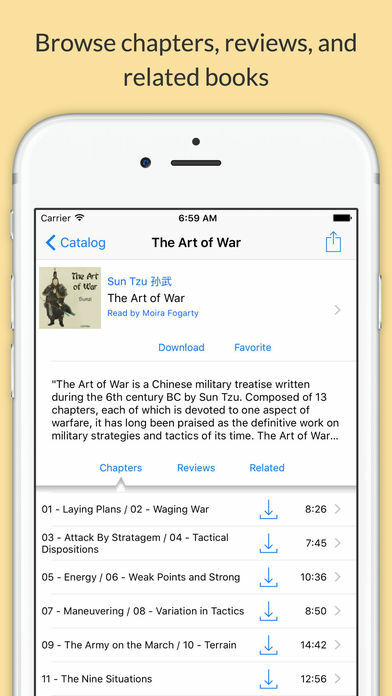 "I found this program to be a nice way to read audiobooks on my iphone. This app was easy to use with little effort." "This is a nice app for free audiobook apps. I have found lots of interesting books to listen to on my commute. A few additional user friendly features such as percentage finished would be helpful, but overall very good." 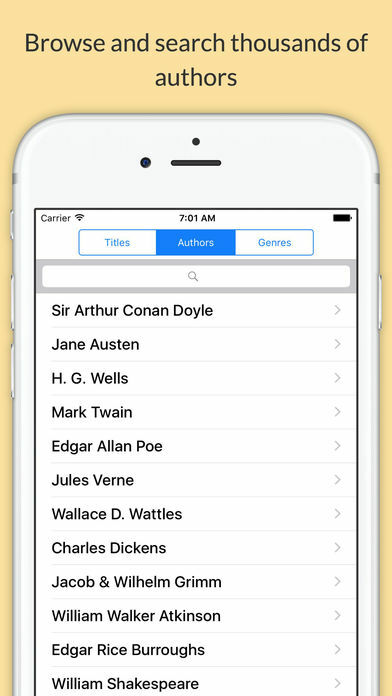 "This is the only library like app I have found with more than 20,000 books. And 30 + languages as well. An extremely well rounded book source." "This is your standard public domain book database fare. I found it to be somewhat feature rich, and it's nice to have so many classics available as audio files. As to be expected, you'll have to look elsewhere for all the latest books." "LibriVoc is a really nice player for audiobooks! There's so many free ones to choose from, and it's so much fun to share." "When it comes to audiobook services, I have always been loyal to LibriVox because it's free. And it has a catalog where you can conveniently search what you want to listen. " "LibriVox Audio Books has over 24000 books available at your fingertips. It includes over 30 languages as well. The best part is they are all free!" "Well, this isn't a free website for downloading e-books. Well, some of the books are free, I should say. But those titles aren't the one I am really looking forward to reading. The best ones, you have to buy. But I also know that it is better to pay for those items, at least the writers or the authors would get their share and would probably allow them to write more. " "I love to read but I'm always on-the-go and I can't be bothered to just sit down and read a pocketbook, that's why I'm so grateful that I found Librivox's selection of free audiobooks that I could simply listen to as I commute on my way to work. "